One of the blog’s most popular posts over its 8-plus year history is about residual sugar. That’s because it uses English instead of winespeak to describe what residual sugar is and what makes a sweet wine sweet. And that residual sugar is the sugar from the grapes that’s left over after fermentation; more residual sugar makes a sweet wine, and the absence of residual sugar makes a dry wine. Two things are missing from that post: Nifty charts and graphs, mostly because the Wine Curmudgeon is not a charts and graphs guy, and an update that better describes how dry wines can seem sweet thanks to post-modern winemaking techniques, which include adding sugar or something similar (corn syrup, grape juice concentrate) to the almost-finished product. That’s one reason why a dry wine with 14.5 percent alcohol, where there is an absence of residual sugar, can seem sweet. Plus, I never really explained how residual sugar is measured and the various levels of sweetness, since it confuses me. I have problems with g/L, which is grams per liter, as well as converting it into percentages, which I do understand. But, thanks to two terrific websites, we not only have charts and graphs, but more insight into adding sugar to already-fermented wine, as well as how to measure residual sugar and what the measurements mean. 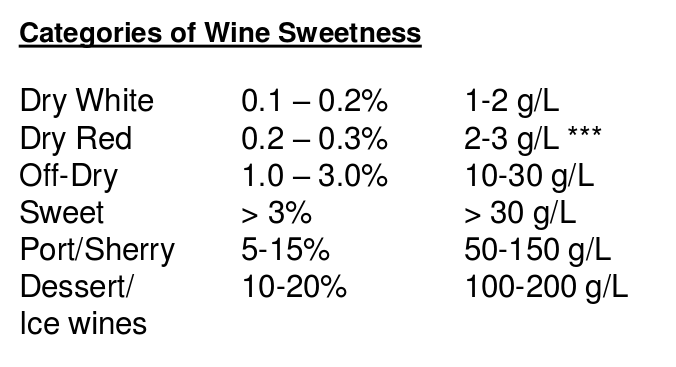 My thanks to Liquid Party Works, which has one of the former and some of the second (which you can find at the link), and to Frank Schieber at MoundTop MicroVinification, whose chart detailing sweetness levels is perhaps the best I’ve ever seen (even if it’s not all that pretty). That’s the one at the top of this post. White zinfandel, for example, would be in the 3 percent category, while a dry riesling and some sweet reds, like Apothic, would be in the 1-3 percent category. Doesn’t get much more straightforward than that. So what is the category name for between 0.4 – 0.9? sweeter than under 0.4- less sweet than 1.0? How about grocery store merlot? Seriously, those wines are still dry, but less dry than those at lower levels. Didn’t include it for two reasons, Christian. First, I didn’t want to muddy the waters — this was about one chart to help people figure out how sweet sweet can be. The riesling chart is actually more complicated than that, since it takes acidity into account. Second, I have written about the riesling scale many times, and have supported it in my Quixotic quest for intelligent back labels — https://winecurmudgeon.com/making-wine-easier/. I have developed a potential problem with high levels of Blood Glucose which can lead to Diabetes. This is very strange because I do not consume very much sugar. I do however like wine. When wine is made, it was my understanding that all sugar was concerted to alcohol. I now understand that there is a tiny amount of residual sugar left and that some makers actually add back sugar. I would guess that the amount of sugar I could consume by drinking dry table wine is very minimal. Am I wrong? How much sugar would be contained in a glass of dry red? I’d ask a doctor. That’s not really something we know much about here. I was diagnosed with type II over 3 years ago, and I spoke with my doctor. His advice was it’s ok in moderation, i.e. 1-2 glasses a day, which I rarely do. My consumption is normally 1-2 glasses 2-3 times a week, at most. It’s a bit more during the holidays, as one might expect, though it’s been 4 days since my last glass of wine. Here’s another rule of thumb, based on a chart on German wine classifications: trocken (dry) will have no more than 9 grams of sugar per liter, halb-trocken (semi-sweet) no more than 18 g sugar per litre. For my favorites, such as spatlese and auslese, I would expect the sugar level to be between 25-40 g sugar per litre. Based on the chart Jeff posted, I’m a bit surprised that eiswein would be that high. Using a 750 ml bottle as a guide, my favorites would range between 20-30 g sugar, or 5-7 g per glass. That compares favorably to a 12 oz can of Coca Cola (which I’ve avoided for 3+ years) that contains 39 grams of sugar. Jeff’s advice is correct…go talk to your doctor. I’ve also learned that it’s good to incorporate exercise into your sugar control program, particularly for quads & gluts…they eat up sugar when they’re put to work. Thanks for the sweet table. It’s hard to believe that sugar added after fermentation is complete isn’t counted in the residual sugar value. Did I misunderstand your second paragraph? Residual is different from added. So no, you didn’t. While it’s useful to know residual sugar and general classifications, the chart shows some gaps. Those gaps (e.g., between dry and off-dry) are needed for winemakers to better inform the consumer because sugar is only one part of a complex array of chemicals that affect a wine’s profile and taste. Notably, titratable acidity (TA) is a major factor as well. For example, a white wine with 0.5% RS with a TA of 0.7% will taste dry. But if the TA was only 0.4% with the same level of RS (0.5%), then it would taste sweeter (off-dry). The numbers I’m using are estimates but the point is that a wine’s taste profile (classification) is affected by more than just one element. Thanks for this, and you are correct. But the point here is that wine sweetness is so poorly labeled and even more poorly understood. Hence, most consumers don’t have a clue. So we have to start somewhere. My other hope is that once we can teach a little about RS, wine drinkers can take the next step to what you’re talking about. We had a wonderful Riesling the other day that was 0.1% RS. But because of how the wine was made (very low temperatures during fermentation), it was very aromatic and full fruit flavors that made it taste sweet, even though it wasn’t. I’m not sure how you would label that. If consumers are taught to look at RS values, they would think this wine was bone dry (it is) with very sharp acidity (it isn’t). At some point, it requires someone to give a description that isn’t full of marketing fluff. And that, my friend, cannot be regulated. Help! Since Sterling Vineyards in Northern California seemingly disappeared in the mid-eighties I have looked everywhere for HIGH residual sugar Zinfandel – and I do mean high. If I’m right, 12% or more. I am asking all enologists or amateurs like me. Am suffering here in Redondo Beach. I miss Petrini’s Market in my home town of San Francisco – it was easy then to get what I really love.